Complete 2019-2020 LCAP Survey now through April 15, 2019! LCAP, the Local Control and Accountability Plan, is a tool that schools use to set goals, plan actions, and leverage resources to meet those goals and improve student outcomes. The Alhambra Unified School District would like to hear your opinions on how we should allocate the various resources available to us. Park Elementary is one of the 279 schools being recognized this year in our first annual report Top Los Angeles Public Schools for Underserved Students! We are so proud to have received this email today and share with you our accomplishment! Park School made the list because it’s one of 279 Los Angeles Schools serving a significant population of low-income African American and/or low-income Latino students and is successfully narrowing or closing the achievement gap for the students. 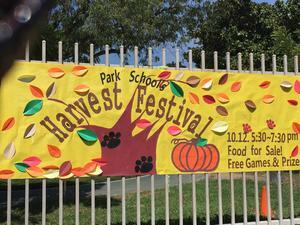 Join us on October 12th for our first ever Harvest Festival. Staff is hosting this event for your entire family's enjoyment. We will have food, crafts and game booths. We hope to see you from 5:30-7:30pm to celebrate the coming of the new season: Fall! Marie Ibsen...AUSD Teacher of the Year! We are proud to have yet another teacher of the year from Park School, Marie Ibsen. On September 21st, Marie was honored at the Southern California Teacher of the Year Banquet where she was among 61 teachers throughout California who were given this title for the 2018-19 school year. We are so fortunate to have Marie as one of our dedicated, stellar, model teachers. CONGRATULATIONS MARIE!!!! PARK is a 2018 DISTINGUISHED SCHOOL! Shop at Office Depot and Park can benefit!